Credit to the new-look Delhi Capitals franchise who have won their Indian T20 League opening game for the first time since 2013. Former batting maestro Sachin Tendulkar and young sensation Prithvi Shaw hail from the same state, but the two feature in different dugouts during the Indian Premier League. 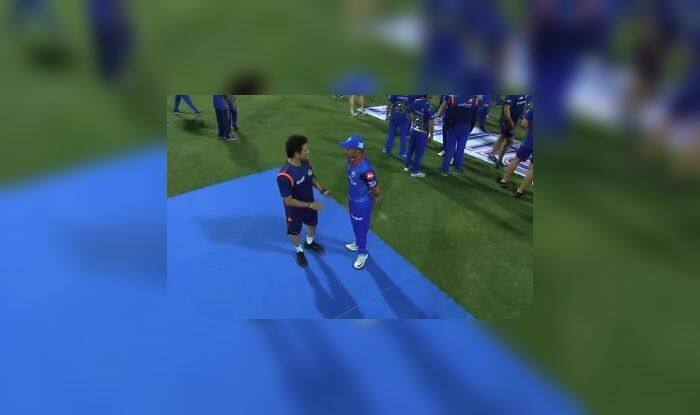 That is the reason why it was a moment to savour when Tendulkar was spotted passing tips to Prithvi Shaw after the Delhi Capitals vs Mumbai Indians clash at Wankhede Stadium. The two were together for a long time ahead of the post-match presentation. It was Tendulkar who was spotted walking up to young Shaw. In the past, the two have been seen in the nets together. Shaw did not get among the runs, yet the Delhi Capitals won the match by 37 runs. Rishabh Pant was the star for the Capitals as he smashed a breathtaking 85 off 53 balls to help Capitals post 213/6. Mumbai Indians had a lot of hopes pinned on Rohit Sharma in a 214 chase but once he departed for 14 there was little to no hope from there. “It’s been a great journey, trying to learn every day in my cricketing career. Always a great feeling when you score runs and the team wins. I always bat according to the situation all the time. Today when I came in, I had to up the ante and so took my chances. It came off tonight. (On his unorthodox methods) Especially in T20, you have to do something different. Sometimes when bowlers cramp you for room, you got to make your own room. (Whether he is ok with batting at 5) Well, (pauses), glad to bat anywhere the team wants me to,” said Pant at the post-match presentation.